Ready for a new children’s-book-as-adult-book to put on your shelf next to The Giving Tree and Oh, The Places You’ll Go? Then make way for Walk On! 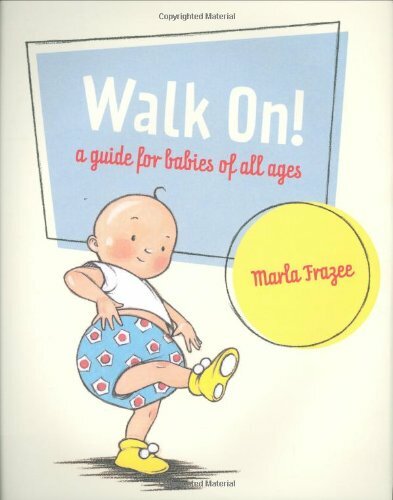 A Guide for Babies of All Ages, by Marla Frazee. I read this, assuming it was a children’s picture book, being as that is how it looks and was cataloged. The book itself is an entire set of instructions on learning how to walk by pulling yourself up, taking a try, getting up and trying again when you fall. I was perplexed. It won’t actually help babies learning to walk, as they don’t have the comprehension skills with which to get the most benefit from the book. Parents won’t grab it for preschoolers, feeling like they have passed this stage. Maybe siblings of pre-walkers? Is that a big enough niche group? Is your diaper weighing you down? Replace “your diaper” with the non-family-appropriate word for what must be in the diaper to be weighing it down, and you will surely see the inside joke in this line. Look for this book to make its appearance at graduations everywhere. Gag reflex not included. I found it odd, as well. I have been informed by professionals that children love this book. I remain skeptical. Edge Of The Forest: Still With MotherReader!